sunday lunch is always a big deal. but our friends at fanatic kitchen studio took it to another level with their interactive chef's kitchen sessions. once again, this was my first time participating in anything like this, but from the time that i had, i know it's not going to be the last. this session that ran for 2 sundays was hosted by chef jason peru. a cool fella who is passionate and knowledgeable about food and cooking. that might have something to do with the fact that he lectures at the Trinidad & Tobago Hospitality and Tourism Institute. just guessing. anyway, how it works is the chef creates a menu that includes a main course and a dessert. this time around he prepared a chicken roulade with carrots, spinach, swiss cheese, yellow peppers and chicken ham, drizzled with a beet reduction and served with a herb spaetzle, sauteed with rosemary and thyme. and for desert, lemon ricotta fritters with fresh strawberry jam. in other words, a deliciously good time. oh! just in case you were wondering, you come with your hands swinging. no tools required. the FKS crew supplies you with everything you need to work just like the pros. and wine. i'm a red lover myself. so chef jason preps some of the fresh, quality ingredients and makes this beautiful spread of color that immediately makes your mouth water. after a little talk about the menu that featured nice little tidbits like "roulade" is a french term that means to roll and rolling citrus like limes and lemons help to soften them up so you get more juice out of them, everyone was in the mood. we got right into it with the first demonstration, which schooled us on how to debone a chicken breast. then he showed us how to tenderized and seasoned it to get it ready to roll. inside he wrapped some spinach, chicken ham, juliennes of carrot, sweet peppers and swiss cheese. then held the wrap together with tooth pics. next he set up a breading station with an egg wash, flour and bread crumbs. wash, flour, wash, crumbs was the order. searing came next. just a few seconds on each side to create a crust which would give us a nice texture and trap in all the flavors when we put them to bake. then came the fun part... our turn. and we made some tasty morsels to bake. came out well if you ask me. but the fun wasn't over. we learned the technique to make the herb spaetzle. it's basically a type of pasta, so you have to make a batter and feed it into a colander over a pot of boiling water. pressing it through the colander makes it into little balls that take about a half minute to cook. then you fish them out with a strainer and put them into cold water to stop the cooking process. into a pan they went with oil and butter to sautee with crushed garlic, some herbs, salt and black pepper. the end result is tasty. something a little different that sits right between a seasoned rice and the regular pasta we're accustomed having. all that was left to do for the main course was to make the beet reduction from beets that were slow roasted in the oven with a little vegetable oil, salt and black pepper. and the mango chow with mango, radish, shadon beni, chive, celery, a touch of lime, salt and black pepper. with the main course done, we went on to make dessert. this started with a tasty fritter batter that incorporated lemon zest, ricotta cheese and almond essence. fried them in vegetable oil 'til golden brown. they were unbelievably light and fluffy. dusted with powdered sugar, these things were great. we had a few before they were plated. i mean... who could resist? all the while in the background, we were reducing some crushed strawberries in some water and sugar to make a delicious strawberry jam to compliment the fritters. with everything done, we had a seat and looked on as chef jason skillfully plated up the main course. followed closely by our beautiful dessert. at this point, the reality of creating a restaurant quality meal set in. what a tasty main course this was. the tangy acidity of the mango chow went well with the savory flavors of the chicken, all on top of the starchy, herbal goodness of the spaetzle. and the dessert was the perfect compliment. light citrus tinges from the lemon ricotta fritters complimented by the tart strawberry jam made the need for a cream element unnecessary. i guess the plates tell the story better than i can. but the only way to really get it is to check out one of these interactive chef's kitchen events at fanatic kitchen studio. it's more than worth it. check the calendar of events on the website and see which one you'll be interested in. thanks again FKS for a great time and a great entry. fanatic kitchen studio is putting a whole new spin on sunday lunch. they're introducing a series of interactive lunches on a sunday where you can learn new techniques and recipes in an intimate hands on demo with a seasoned chef. TDC Pot Spoon Throwdown 2011... YOU COMING? 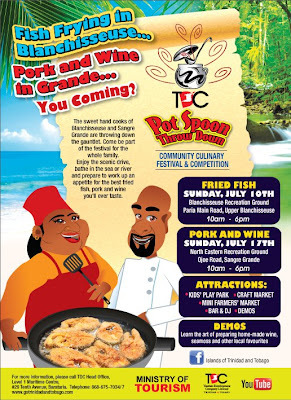 last year we went to the taste t&t events and found them to be our kind of thing. food and fun... what more can you ask for on a sunday? this year, the theme is The Pot Spoon Throwdown. 2 events, 4 teams each. 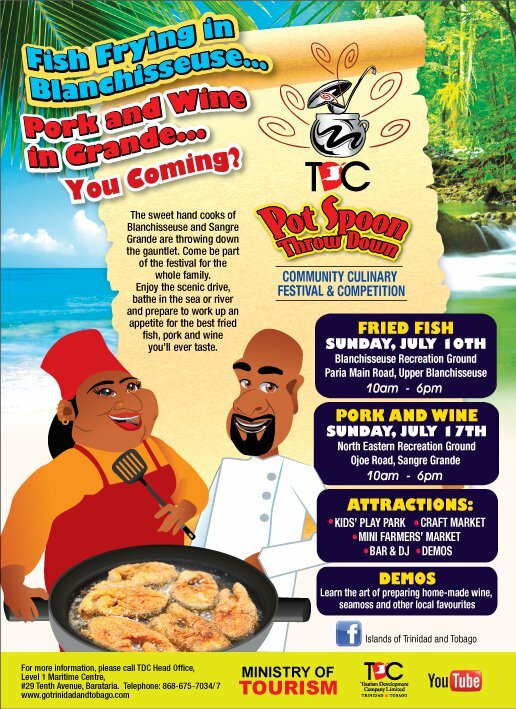 one event features pork and wine, the other fried fish. definitely bring it to the table material. so to answer the question, HELL YEAH WE COMIN!! check out the page on facebook for info and developments.